Leica Geosystems provides farmers with a suite of simple, reliable and affordable agricultural guidance and precision farming tools. Compatible with a wide range of vehicles as well as third-party equipment and modular in software design, Leica Geosystems’ products are flexible and scalable to suit individual requirements. 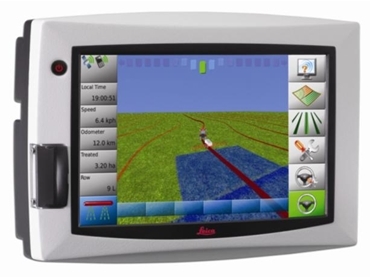 Farmers now have a new option for user-friendly precision guidance with the Leica mojo3D guidance and customised control system from Leica Geosystems. Designed to help growers get the job done more quickly and efficiently, the system combines a unique three-dimensional (3D) user interface with rugged, water-resistant metal hardware built to withstand tough rural conditions. With a large 7” touch-screen display and high-quality three-dimensional graphics, the Leica mojo3D has been built for ease of use. It has an intuitive, icon-based menu structure and setup wizards to minimise the time it takes to set the controls and get on with the task at hand. Users can change settings quickly and easily by tapping the relevant icon, without having to navigate away from the main guidance screen. “The Leica mojo3D truly is the next level in precision guidance,” said Rob Kiernan, Leica Geosystems global sales and marketing manager. The Leica mojo3D comes with AB parallel, A+ heading, pivot and fixed contour guidance as standard, with integrated GLIDE technology for 25cm (10-inch) pass-to-pass accuracy. It has an easy-mount antenna for vehicle roof for a quick install, and a built-in cell modem for in-cab remote service and support via Virtual Wrench. Coverage mapping is also included as standard with the option to store the worked area, save and recall treatments and import/export data from tractor to tractor, or export PDF reports to the office via USB. Users can customise the Leica mojo3D to meet individual requirements, with a range of option packs available including terrain-compensated electric auto-steer via the Leica QuickSteer motor and Leica TWIST terrain compensation unit. Single section or multi-section control to reduce overlap and misses in spraying, spreading and planting applications is also available. Additionally, users have the option to upgrade auto-steer accuracy to 2cm RTK positioning with the Leica mojoRTK.